The debate between P90X vs Insanity continues! I constantly get questions from people asking me if P90X is better than Insanity (or vice versa), or just asking which fitness program is better for them. I try to explain to everyone that trying to compare P90X and Insanity is like comparing apples to bananas. They are two completely different workout programs, but I figured I’d still try to do my best and compare the two. Unlike a lot of people who try to do a P90X vs Insanity comparison, I’ve have gone through BOTH workout programs. I’ve been doing P90X for over a year now, and I’ve gone through a full 60 days of Insanity. I’ll go ahead and start off with a simple P90X vs Insanity comparison chart, and then I’ll give you my opinion on P90X and Insanity. Regardless what program you decide to do, you need to do what’s best for YOU! Fitness Instructor Tony Horton Shaun T.
I started my fitness journey with P90X back in January 2010 and I’ve been doing it over a year now so I’ve got to admit I am a little biased towards P90X (see my results here – P90X Results). If someone were to put a gun to my head and ask me which program is my favorite in the P90X vs Insanity battle, then I’d definitely say P90X. They are two completely different programs though and I think they are both incredible workouts. Some pros to P90X is that it’s a great all around workout that has some awesome resistance workouts as well as cardio workouts. There are also three versions of the program (Classic, Lean, Doubles) that really allow you to accomplish whatever goals you are trying to accomplish whether it be to lose weight, get toned, get ripped or to even add some size. I also really like the fitness trainer that does P90X, Tony Horton. He is a goofy guy that really makes the workouts fun. I also just really enjoy the resistance exercises within P90X. During P90X you’ll be doing a lot of your classic pull ups, push ups, etc. A majority of these moves are very simple and straight forward to do so you’re not having to spend 30 minutes or more just learning how to do them properly. That means you can focus more on you form and reps to make sure you get the best possible workout. I ended up doing the Insanity workout after several rounds of P90X. My weakness has always been cardio, so I figured Insanity was just what the doctor ordered. After 60 days of doing the Insanity workout, I’ve got to say that I was shocked as to how much my endurance and cardio strength improved. Cardio definitely isn’t my weakness anymore! Insanity is a full body workout just like P90X, however Insanity is obviously much more focused on cardio/jump training and you’re going to be doing a lot of very quick and intense moves. Some pros to Insanity is that the workouts don’t require ANY equipment. That is a huge pro because you don’t have to store any bulky equipment in your living room or garage, and it makes the workouts really easy to stick with if you travel a lot. Also the workouts are shorter than P90X, and the overall length of the program is shorter. That makes it easier for most people to stick with the workouts and makes it easier for those doing the program to complete the entire 60 day routine. Also, for you cardio lovers, Insanity will quite possibly be the hardest cardio workout program that you ever attempt. The Insanity workouts are pretty much designed so that only Superman and can through them without stopping, but that allows you to push yourself harder and harder each time you do them. I’ve heard from a lot of runners that you get a “runner’s high” after completing a long race (I’m not a big runner, but my wife is). After doing an Insanity workout and giving it my all, I’m so freakin exhausted, but I feel INCREDIBLE! I guess you could say I get an “Insanity high” after doing the workouts! Some cons to Insanity is that it isn’t a program for beginners and if you’re trying to bulk up, this program isn’t for you. Since you are just using your body weight as the resistance, it’s going to be very unlikely if not impossible to bulk up with the workouts. The workouts are very, very intense so if you’re just getting back into fitness after years and years of not working out, then it isn’t recommended that you attempt Insanity. It is now time for YOU to make a decision on whether you are going to do P90X or Insanity. The ultimate winner in the P90X vs Insanity battle is truly different for everyone. They are both incredible workouts that WILL give you extreme results if you stick with them. The most important thing is that you make a decision now and just do it! If you are looking to lose weight, get toned, or to bulk up AND you have the time each day to commit to P90X, then you should order P90X and just do it. On the other hand, if you are a cardio lover, you’ve been consistently working out for at least a few months, and you possibly travel a lot, then Insanity is the program for you. I hope that you found my P90X vs Insanity blog post helpful. 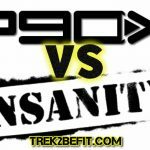 Make sure to leave lots of comments and let me know what your favorite workout is when it comes to P90X vs Insanity. If you did find my P90X vs Insanity blog post valuable, then also make sure to share it by clicking any of the links below.